Federal investigators are looking into state Senate Majority Leader Dean Skelos' sources of income, according to people familiar with the investigation. U.S. Attorney Preet Bharara is taking a hard look at Skelos’ ties to the real estate industry, among other areas of inquiry, the sources told NBC 4 New York. Skelos, the highest ranking Republican in state government, has not been charged with any wrongdoing. The revelation that Skelos is under investigation comes a week after Democratic Assembly Speaker Sheldon Silver was arrested and charged for allegedly taking $4 million in bribes. Silver denies the charges. New York State Senate Majority Leader Dean Skelos is fighting back against NBC 4 New York’s report that he is under investigation. Government Affairs Reporter Melissa Russo reports. A Skelos spokesman did not return numerous calls for comment before NBC 4 New York published this story Thursday. On Friday, his office released a statement saying the senator had not been contacted by anyone from the U.S. Attorney's office and, "as such, we won't be commenting further." “Last night’s thinly sourced report by WNBC is irresponsible and does not meet the standards of serious journalism," the statement from spokeswoman Kelly Cummings said. Skelos is a lawyer and works as counsel at Ruskin, Moscou & Faltischek in Uniondale. A spokeswoman and a partner at the firm, as well as an outside spokeswoman for the firm, did not answer questions as to whether the firm has received subpoenas for information about Skelos’s legal work and income. The firm is not a target in the probe, a source said. A spokesman for Bharara -- who has been leading the investigation into Albany corruption -- declined to comment, as did FBI spokesmen in New York and Washington DC. In a speech this week, Bharara was critical of the way Albany does business. "Politicians are supposed to be on the people's payroll, not on secret retainer to wealthy special interests they do favors for," Bharara said. New York State Assembly Speaker Sheldon Silver was arrested Thursday on federal corruption charges and is accused of using his position in the state legislature to collect millions of dollars in bribes and kickbacks, according to a criminal complaint. Jonathan Dienst reports. A native of Rockville Centre, Skelos was elected to the state Senate in 1984, and is now serving his 16th term. He represents District 9 in the Senate, which comprises the southwest region of Nassau. Former federal prosecutor Robert Ray called news of the investigation into the Senate leader unsurprising. "Given what we know what has happened in Albany and the cesspool that has taken over the state legislature, it is not at all surprising they are looking in other directions," he said. Ray cautioned the existence of an investigation does not mean charges will be filed. 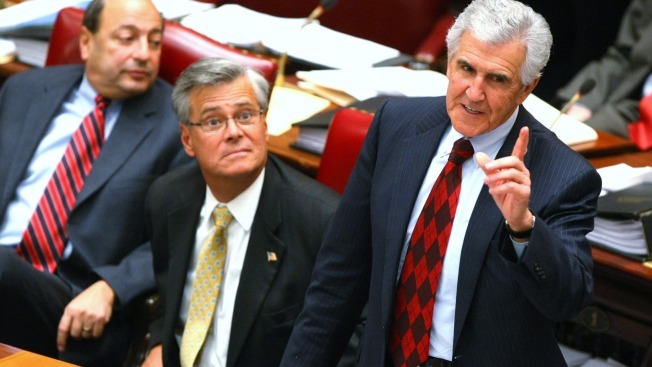 But Ray said that it is seemingly “unprecedented” in Albany politics that the senate leader is under investigation at the same time the assembly speaker was arrested. Bharara’s broader investigation is focusing in part on how some part-time legislators make their outside money. While the feds are not saying who, if anyone, might be charged next, Bharara, in announcing charges against Silver last week, made it clear the probe is far from over. -- Pete Williams and Richard Esposito contributed to this report.